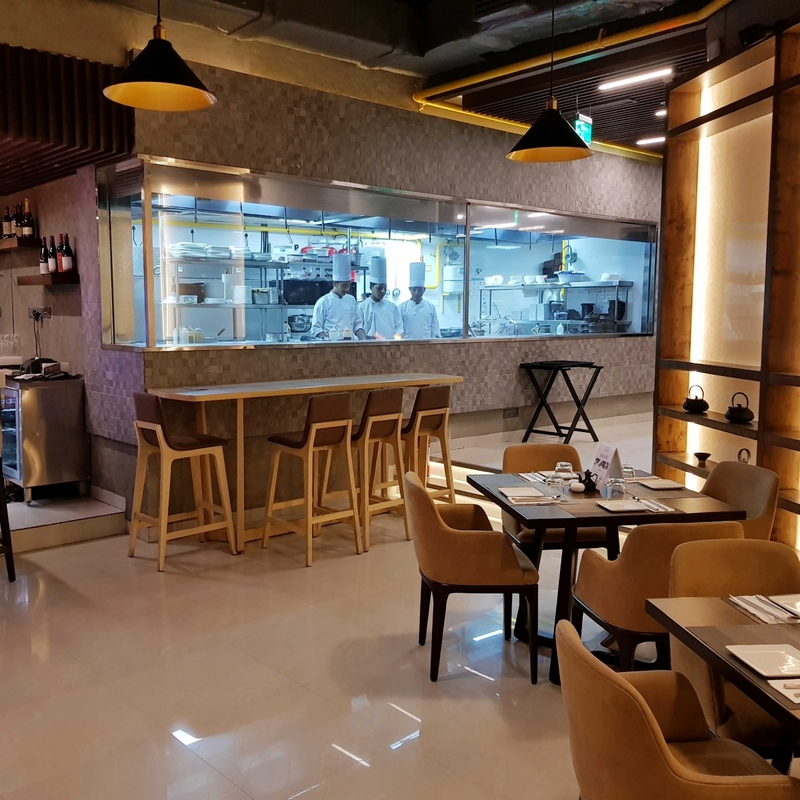 Located on the ground floor of One Horizon Centre, Gurgaon, is Lite Bite Foods’ youngest baby. The guys behind Delhi’s FresCo, Zambar, Punjab Grill and Asia 7 have partnered with a South Korean native to give their loyal patrons Hahn’s Kitchen. All wooden interiors are accented with elegant cutlery placed across the walls. Private dining rooms allow you to sit on the floor and bond over a meal as you would in South Korea’s most traditional restaurants. All of these were taken when we arrived, though, so we got a table in a cozy corner overlooking the live kitchen instead. By the time our starters arrived, the ban san—kimchi, egg, lotus stem, fried aubergine and veggie pancakes—had taken up a lot of stomach space. The gochujang marinated samgypsal—a popular Korean chargrilled pork belly slathered in a spicy marinade—was accompanied by lettuce leaves, rice and a soybean paste soup. All the flavours hit the right spots; the belly was perfectly cooked with a slightly crispy crust. Each bite melted in the mouth and had a pleasing amount of spice. Our helpful waitress, Lucy, showed us how to enjoy it like the Koreans do: like a taco, by wrapping some pork, a spoon of rice and a bit of soup in the lettuce leaf. Dongrae haemul pajeon seafood (Korean seafood pancakes) had the texture of American pancakes, but were tangy instead of sweet. They were very mildly flavored so as to not overpower the taste of the seafood, but in their quest for mildness, lacked salt, too. We starting to get quite full, but couldn’t resist sharing a "Korean spicy soupy noodle" for mains. It took less than five minutes to reach our table, but after only a bite, we were shocked to realise that the dish was Shin Ramyun Instant Noodles in a fancy bowl. A let down; we would've stayed home if we wanted quick, packaged food. The dessert menu had us excited about local favourites, but we were disappointed to actually see none around. Nonetheless, we a got a lemon tart to end on a sweet note, which was too tart to finish all of. As we ended our meal, we also realised that buff bulgogi had been missing on the menu. There's bulgogi with other meats indeed, but that’s like a Dilliwala going out hoping for butter chicken and ending up with shahi paneer. Our experience at Hahn’s started with a bang, but fizzled out soon after the second starter.